Neptunium, successor of uranium, was discovered in 1940 by Edwin McMillan and Philip H. Abelson while they were trying to isolate fission products. It is used in plutonium production which in turn has uses in military and is also used as fuel to provide electricity to space craft. Dmitri Mendeleev published the periodic table with the then undiscovered elements indicated by dashes. At that time uranium was the last known element with atomic number 92. In Mendeleev version of periodic table and the later version of periodic table, published in 1913 by Kasimir Fajans, an empty space after uranium indicated a possibility of a new element. After the discovery of induced radioactivity in 1933, Enrico Fermi with his group members bombarded all the known elements with neutron and analysed that heavier elements would disperse the energy by emitting gamma ray. Emission of gamma ray results in beta decay which in turn increases the atomic number of the resulting isotope. Neutron bombardment on uranium resulted in an isotope with atomic number 93. Fermi published his finding of element 93 but several objections were raised against his claims. Fermi was not able to prove his claim as he was unable to isolate the newly created element. In 1934, Odolen Koblic claimed to have extracted a small amount of element 93 from pitchblende but when analysed it turned out to be a mixture of two other metals. In 1938, Yvette Cauchois and Horia Hulubei claimed to have discovered element 93 via spectroscopy but the claim was denied since it was then believed that element 93, if it exist at all, would not exist naturally. In 1939, Edwin McMillan decided to bombard uranium with cyclotron to separate fission products. McMillan observed a new half-life of 2.3 days in his sample results. This element had chemistry like no other known element and was similar to uranium. McMillan, with the help of Philip H. Abelson, finally isolated the source and published their results in 1940 . Element 93 was named after the planet Neptune following the naming of Uranium which was named after the planet Uranus, Neptune being the next planet after Uranus in our solar system. Neptunium is only present on earth as an intermediate decay product of other elements. Because of its relatively short half-life any primordial element would have decayed by now. Neptunium isotopes are found naturally in uranium ores which are formed as decay products from the transmutation reactions. 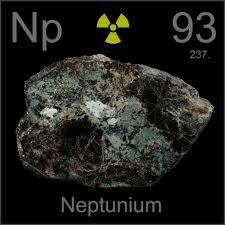 Majority of currently existing neptunium on earth is produced in artificial nuclear reactions. Neptunium is a radioactive metal. It has hard silvery metallic appearance and tarnishes with the exposure to air. It occurs in three allotropic forms. Neptunium has 7 electrons in its valence shell. Neptunium is the first transuranic element and belongs to actinide series. All transuranic elements are unstable and decay into other elements radioactively. It is represented by the symbol Np and has atomic number 93. Neptunium is a very reactive metal. It is pyrophoric at room temperature in powdered form. Neptunium is the heaviest actinide that has the ability to lose valence electrons in stable compound. The most stable state in solid form is +4 while +5 valence state is preferred in solution form . Neptunium is used to for the detection of high energy neutrons. It is used as precursor in production of plutonium, which in turn is used as fuel in thermal generators to provide electricity to spacecraft and has applications in military . Neptunium is fissionable and theoretically can be used to make nuclear explosives or can be used as fuel in fast neutron reactors. There are 20 radioisotopes of neptunium that have been characterized. The atomic weight of isotopes of neptunium range from 225.0339 u to 244.068 u . Np-237 has the longest half-life of about 2.14 million years. Np-236 and Np-235 also have half-life of a year or more than a year. The rest of the known isotopes have half-life ranging from few days to less than few minutes. There are seven isotopes of palladium, out of which only one is unstable. Palladium-107 is the most stable radio-iso tope and it have a half life of 6.5 million years. There are eighteen radioactive isotopes of palladium that are artificially produced and have atomic masses that range from 90.94 to 122.93. most of these isotopes have half-life of less than half an hour, expect palladium-101, palladium-109, and palladium-112.
. C.R. Hammond (2004). The Elements, in Handbook of Chemistry and Physics (81st ed.). CRC press. ISBN 978-0-8493-0485-9.
. Hindman J. C. 1968, “Neptunium”, in C. A. Hampel (ed. ), The encyclopedia of the chemical elements, Reinhold, New York, pp. 434.
. Lee, J.; Mardon, P.; Pearce, J.; Hall, R. (1959). “Some physical properties of neptunium metal II: A study of the allotropic transformations in neptunium”. Journal of Physics and Chemistry of Solids. 11 (3–4): 177–181. doi:10.1016/0022-3697(59)90211-2.